One person was shot and killed in Goffstown, New Hampshire Sunday evening. One person is dead in a shooting near a New Hampshire hardware store Sunday evening, according to authorities. Calling the death in Goffstown "suspicious," the state attorney general's office said the investigation is "unfolding." Authorities said late Sunday evening that all parties involved were located. Local police had previously said they were searching for a suspect in a shooting near the Ace Hardware Store on Depot Street. Police cruisers and an ambulance were spotted at Sully's Suprette just a block away. An official at the scene wouldn't get into specifics, but said the area was part of the investigation. Goffstown police had also said earlier Sunday evening that there were multiple injuries. The attorney general’s office did not say whether there were any other injuries. 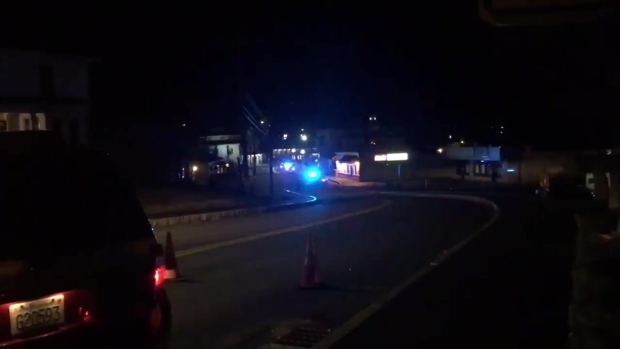 Police are blocking traffic from entering the town of Goffstown, New Hampshire while they search for a shooting suspect in the area. The public doesn't appear to be in any danger in connection with the incident, according to the attorney general. Traffic had been blocked from entering Goffstown Village; however, Main Street has since been reopened. Some local businesses were closed as a precaution. SWAT teams were also seen in Goffstown.